How one would do business? How one would do business when the deal is about 30 billion USD? I am sure, one would preserve each detail of his transactions more carefully than what he may be doing with his life. The last thing one can expect from someone when money of such amount is involved is to see a sorry state of affairs where all files/documents related to the deal goes missing. Just like going, going and gone into the thin air. Lets make it little more generic. How a nation should manage things when it involves auctioning out its natural resources for business purpose? When a public office like the government of the country gets involved in matters of international dealings, preserving every minute details of the transaction becomes paramount. It not only felicitates smooth auditing at later stages, it also brings in that required transparency. Last thing one can expect a government to do is to mismanage the whole affair at its stinking best, so much so to even lose files that contain details of the transaction from day one. This even becomes more laughable when one sees; the department that messed up even with this basic functioning of maintaining files and papers comes directly under the priminister of the nation. Try imagining a corporate house where an individual messes up to such level and he still remains there on his post without anyone around him caring an ounce for what is happening. That is India for you and the man who messed up bigtime (intentionally or otherwise) is Sriprakash Jaiswal. And yes, the moron is still rooted to his post of the coal minister after making such hara-kiri of his day to day functioning. When the whole Coal scam was unearthed (at the backdrop of mega marvels like 2G, CWG and Adarsh) our media was all over the place. The topic went through much fanfare since the ministry is directly under the watch of PMO. Usual mudslinging went on, both in front and behind the cameras. The jingoism of accountability went so overboard that an entire parliament session was washed out. The opposition relentlessly shouted and very rightly so for the priminister to stand and own up the responsibility. But the government of the day, sticking to their nefarious reputation of exhibiting some high end shamelessness, stick to their ploy of keeping mum; not that they had anything credible to explain though. As it has become a routine affair with all recent day scam investigations, the apex court intervened and decided to preside over the investigation themselves. Here I must say, the involvement of the apex court looks judicious knowing the reputation of a notorious and lethargic establishment like CBI and their complete disinterest in investigating anything that involves an equally notorious UPA government. As a faithful servant of his master our CBI can be, the investigation didn’t take off until the apex court took both CBI and the government in strict terms. Reluctantly the CBI started their shoddy investigation for the heck of it while the idea was more to cover up the trails than unearthing them. As early as July this year, CBI has managed to achieve nothing from their investigations. All that the premier watch dog of the nation managed to do is to ask for all the files that are related to this mega Coal scam. On the first day of hearing, the rebuttal of the apex court for the Coal ministry and CBI makes some interesting reading. Not only reading, it also extradites the rot that we were offered in the name of investigation; well sugar coated though. While answering to the query of the court, on why the coal ministry still has not shared the files with the investigative team, the reply was anything but a big insult to the nation. The thick skinned morons in our coal ministry have this bizarre excuse to furnish for the delay. Since the boxes, those contain the said files were kept vertically, one atop the other in order to save space, it is taking time to put them back horizontally and scan their contents. Vertical and horizontal orientation? Seriously? You may feel, such school boyish of an excuse can’t be expected from serious government offices but that is how it stands and it is true. Such horrendous excuses were bound to irritate the living daylight out of court and that is what precisely happened. The court came down heavily, both on CBI and the coal ministry after this vertical-horizontal geometry and asked them to pull their shocks and work like professionally run institutes. In no lesser terms, the court directed the CBI to get hold of the files by the next hearing date. Do you think the shamelessness would have ended there? I pity you if you thought it to be so. 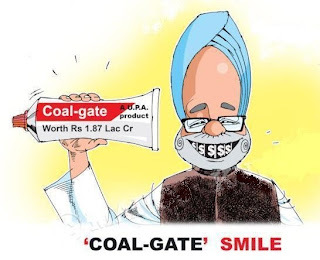 Just when we all assumed the government has reached the lowest point in morality and ethics, the coal ministry went ahead and proved all of us wrong. In a recent inexplicable news, the nation was told how the files, which were touted to be there in those vertical, later on placed horizontally boxes, have gone missing. Wow!! Is the first word comes to my mind. Such important files, more so when an investigation is going around them is lost in thin air; just like that? Not one or two but in fact 157 of them. Either there are serious callous people in our coal ministry, who just don’t know how to take their job seriously or the files were lost by design. Either way the proposition looks anything but scary. But knowing the past records of how this Congress government can stoop to levels not known to humans, the files missing by virtue of a designed conspiracy is more than just a probability. Drawing parallels, one can realize why the Mumbai Mantralaya was torched more than one occasion to destroy all the documents that could have nailed the morons of Adarsh scam. You might feel you heard enough; but hang on. I am not finished detailing the impudence yet. In fact shamelessness even defied its own definition when, rather admitting their evil intent, we had hoard of Congress sycophants, better known as their spokespersons, all over the place defending such despicable incompetence or nefarious actions; whichever way you want to see it. Even the UPA chairman was not upset seeing the blatant miscarriage of governance but was upset since the gimmick called ‘Food Security Bill’ couldn’t be passed on a day as auspicious as the birth anniversary of her husband Rajiv Gandhi. That is so ridiculous on the part of Sonia Gandhi to accuse the opposition for disrupting the parliament on account of Coalgate missing files. What the opposition is supposed to do, Mrs. Gandhi? Sweep the massive criminal agendas of your government under the carpet and be a party to your loot? This is where we as a nation have ended up at. The mistake that we made 10 years back in electing such thugs has snowballed into this uncouth of a government full with liars, swindlers and morons of best quality. For them governance, nation, citizens and all other such frivolous nonsense doesn’t stand any importance. All that important for these UPA morons is their chair, the power they enjoy in expense of the nation and their votebank. Rest all can go to hell if that is the requirement. Do we really want such arrogant, incompetent and moronic criminals to rule the nation? Do we really want these uncouth louts to get back to power next time? If the answer is NO, then make sure to vote out these scoundrels at the first chance we get. I am sure, we as a nation deserve far better government that what these bastards offered us in last 10 years. "The mistake that we did 10 years back in electing such thugs has snowballed into this uncouth of a government full with liars, swindlers and morons of best quality" - Couldn't agree more. It is we who have allowed the thugs to loot and it is we who must show these morons their place. There are very few people who still think sane Murli. Think of the people who still not getting proper 3 meals a day, but with the hope of getting another term congress has come up with Food Sec. Bill!! Feed the poor and get the votes seems to be mantra for Congress for decades. Any why only 10years Murli? Congress after independence has been a curse for all these years. 3. Make sure you persuade/cajole/inveigle all your neighbors to positively come out & cast their votes on the Polling day. 4. If you a TRUE PATRIOT, each one of you, please contact at least 50 RURAL VOTERS near your place & educate them to vote AGAINST Congress or its allies. CAUTION: ALL PREPARATIONS HAVE BEEN MADE TO "RIG" THE COMING ASSEMBLY ELECTION IN "RAJASTHAN". 25% OF THE ELECTRONIC VOTING MACHINES HAVE BEEN MANIPULATED - meaning all the CAST VOTES in those MANIPULATED MACHINES will be REGISTERED in favor of CONGRESS CANDIDATE irrespective of WHO the voter votes for. Missing files ? Or burnt them in Tandoor. Jaiswal must be having kababs for sure.